YaSM service management projects are characterized by a typical course of action, independent of the size of the organization and its range of services. This made it feasible to devise a time-tested project blueprint which can serve as a guideline for a wide range of YaSM, ISO 20000 and other service management initiatives. How to implement YaSM service management? 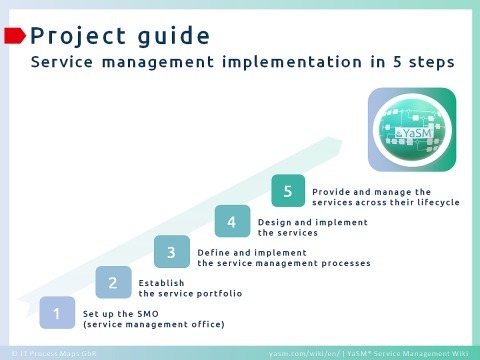 The 'YaSM Project Guide in 5 Steps' describes a number of typical activities in a YaSM service management project. As a preparation for any YaSM or ISO 20000 project, it is essential that the key players in the service provider organization familiarize themselves with the YaSM principles, so that they are in a position to communicate to all parties involved the benefits of service management best practice and to explain the steps required for its implementation. This wiki is the ideal starting point for getting acquainted with YaSM. 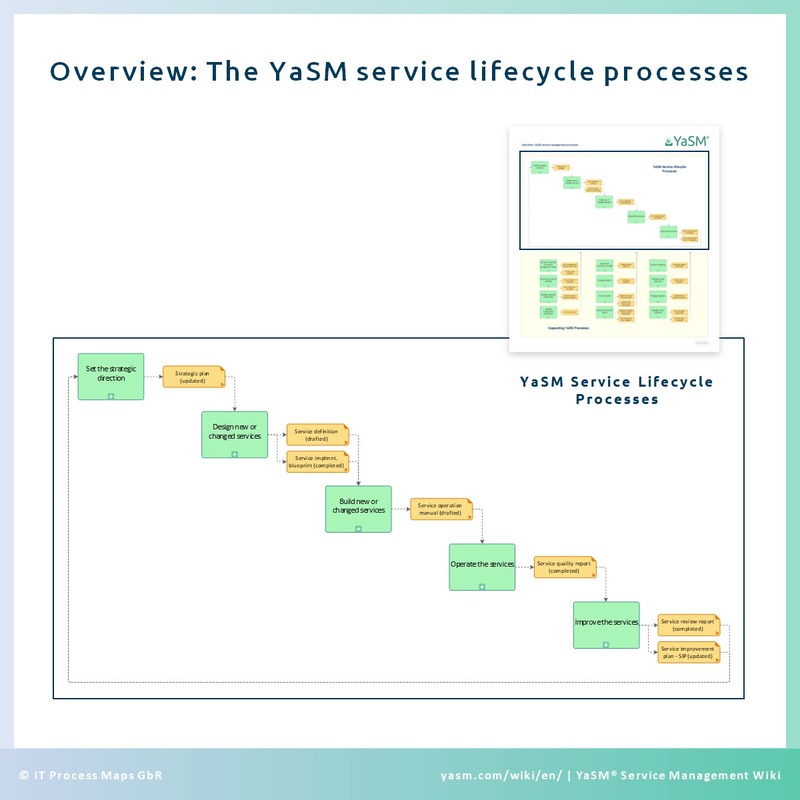 More detailed information can be found in the YaSM process model - the YaSM® Process Map: Its process diagrams depict in an easily readable format how YaSM works, presenting both the big picture and the process details (see figure 2). 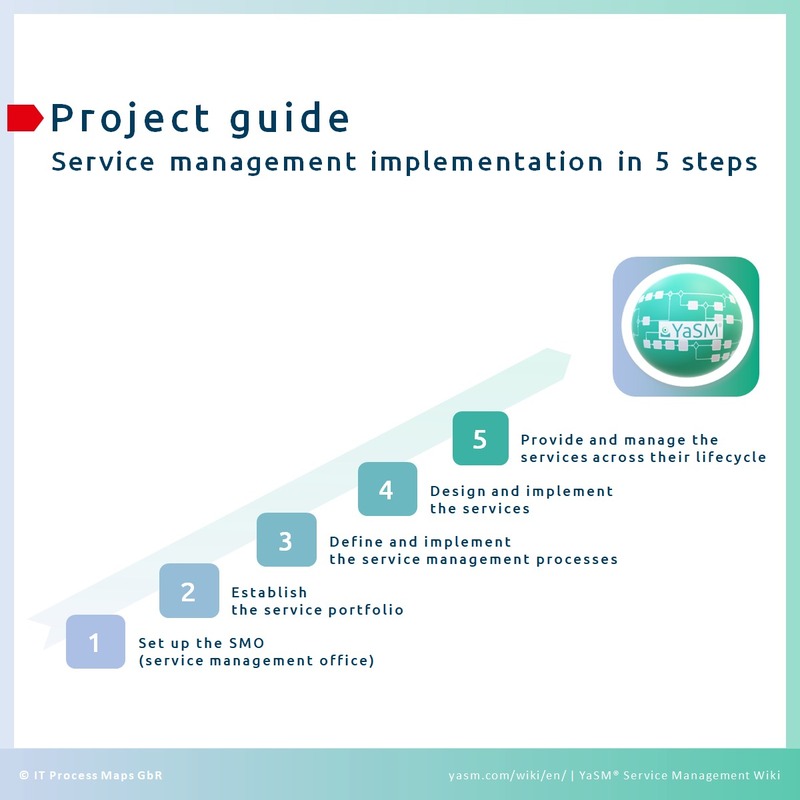 Since YaSM projects are about designing and implementing a number of service management processes, it is also important at the beginning of such a project to establish the means for documenting and managing processes. Acquiring an understanding of process management principles will be helpful in this respect. What is more, if the organization does not have a tool for documenting its business processes, the beginning of a YaSM project is a good opportunity for selecting one. The YaSM® Process Map is available for a number of platforms, including Microsoft Visio® and ARIS™ by Software AG. Organizations using one of those applications are able to work with the YaSM process diagrams in their native format out-of-the-box. 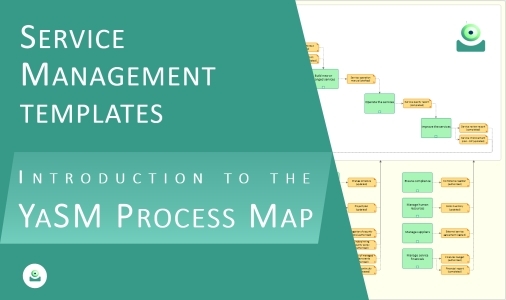 In this short introductory video Stefan Kempter introduces the YaSM Process Map and explains the structure and contents of the service management process model. For more information see page "YaSM Implementation with Process Templates". Is based on: The YaSM Process Map. - Document: YaSM Implementation Guide. By: Andrea Kempter and Stefan Kempter , IT Process Maps. This page was last edited on 28 March 2019, at 19:42.